SpringBoot 2.0 的基礎是基於 Spring Framework 5.0, 所以 5.0 支援的東西, 它當然也會有, 那這東西 大陸那邊翻譯叫響應式? 好吧...中文是還蠻準確傳達的XD, 我大概理解就是你可以當成一個完全異步的框架 就好比是 NodeJS, 你可以在 http://start.spring.io 列表這邊看到一票組建在2.0都換成支援 Reactive 的套件了, 有些則是連底層驅動都換了. 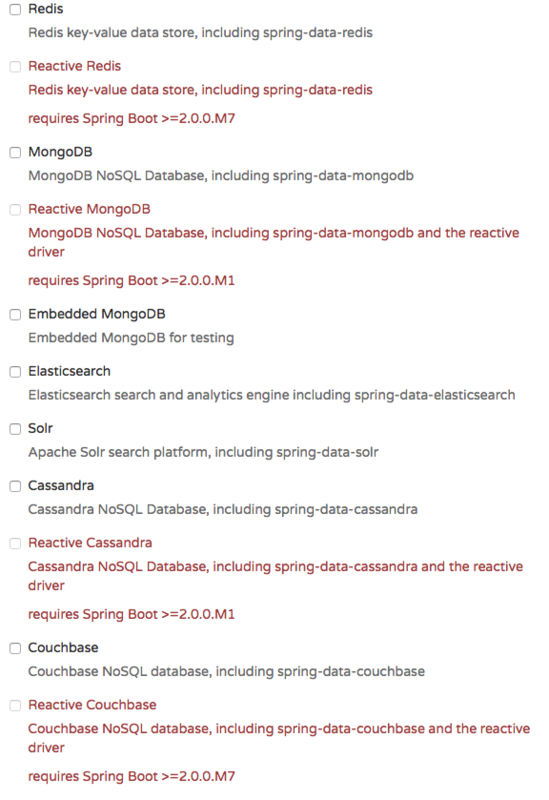 Spring Boot 2.0 is going to require that you run Java 8. This means that Java 6 & 7 will no longer be supported. My guess is that one of the 1.5.x releases will be the last version to support this. I also am excited that Java 9 is going to be supported as well. Spring Boot’s Gradle plugin no longer automatically applies the dependency management plugin. Instead, Spring Boot’s plugin now reacts to the dependency management plugin being applied by importing the correct version of the spring-boot-dependencies bom. This gives you more control over how and when dependency management is configured. Full, producing all output in memory and sending it as a single output buffer. Chunked, producing output in buffers (chunks) of a configurable maximum size and sending them to the client as they are produced. Data-Driven, making Thymeleaf work as an integrated part of a reactive stream of data, rendering HTML for the produced data in a way fully sensible to reactive back-pressure, sending HTML chunks of output to the client as data is produced (and optionally shaping this HTML chunks into SSE events). @ConditionalOnBean now uses a logical AND rather than a logical OR when determining whether or not the condition has been met. 大概列出而已, 其實有些還沒用到也沒什麼感覺, 不過主要就是 Reactive Support 吧, 光是這個就蠻值得了, 以前要做也不是不行就還蠻麻煩的, 現在有框架層級的支援, 應該會更好處理吧. 其實在那邊吵語言或是框架, 其實意義沒有很大, 效能或許是一種指標, 但也不是絕對, 主要還是看整個生態 社群 是否活躍吧, 可以持續改善下去才有意義, 不然到最後被棄坑了......就悲劇了. 如果你現在就想使用 微服務架構 直接用 Spring Cloud 或是 你想上 Kubernetes 我覺得都是還不錯的選擇.